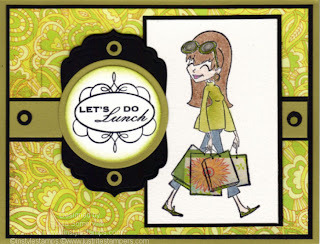 Designs by Lisa Somerville: Let's do Lunch! I love to use up my scraps of Pattern Paper using the Paper Piecing Technique....BUT on this card I didn't use Pattern Paper! I used the Zine Piecing Technique from the current TJNL, to piece the packages. Sure makes you look at magazines in a whole different light! This is super cute, and Holy Smokes, you colored......hehehehe.looks great! Just luv the designer bags using this tech! Wow, love those bags, very cute card. What a super fab card! Great job!